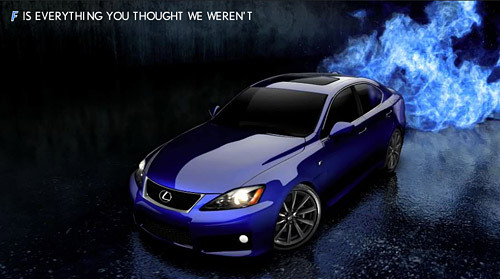 “It was very important that this creative look and feel nothing like traditional Lexus advertising,” he says. “Typically, everything we do is light, and very refreshing; this needed to be more aggressive and menacing,” he says. Bolain says that although there will be no national broadcast ads for F, “dealers liked the cinema ads so much that they asked that we create a broadcast spot. We took three fifteens and glued them together to make thirty,” eliminating repetitive text and footage. Each ad will be 15 seconds long, and will play between the other, longer advertisements shown before a movie.